What is 123 years old and has 10,000 amazing items on 4 kilometers of shelving? You would be exactly right if you guessed that this must be THE TREASURE OF ST. BRIDE in London, one of the world’s largest libraries of type books, punches, matrices, matériel & myriad typographic ephemera. HISTORY IS COMPLICATED. Perhaps not, if you’re Paul Barnes. Few type designers have been more passionate about a type boom of the 19th century—and gone on to apply it so successfully in their work. Paul, co-founder of Commercial Type, uses some of this historical energy supporting (as a trustee) the St. Bride Foundation in London. Within these walls, there are thousands of volumes—from histories and bibles to stacks and stacks of specimen books. There are also tons of steel, copper and various blends of metal formed into punches, matrices, and a horde of typecasting equipment. Not to mention a certain amount of wood. Most of these items can look mysterious or alien. Unless you were born into the trade before 1920. Or had the advantage of an enlightened typographic education. Leave Fleet Street at Bride Lane, wander past St. Bride church and you run right into the St. Bride Foundation, a colossal collection of (mostly) English typographic history. Room 19 is its mother lode: incorporating a former lecture hall, the room rises by long steps—meaning you can see the top of the last row from the bottom of the room—and every inch of the terraces is mobbed with archives and documents of every size and description which chart the ebb and flow of English typography, and includes countless original drawings. There are more rooms, certainly, and many more shelves at St. Bride, but Room 19 holds a special aura for those who work here. But don’t get any ideas: You can’t just walk in and ask to see the goods. IN THE 19th CENTURY, Fleet Street was a hive of foundry and printing activity, made possible by the mega concentration of newspapers as well as the earliest forms of advertising agencies, and became known as the “street of ink.” Everybody needed type—the physical kind—and tastes were evolving exponentially. Massive sans serif types first appeared during this time, as well as muscular Egyptians, and what one foundry did well, another tried to do better. A good dose of competitive mayhem reigned. And skilled craftsmen were in high demand. 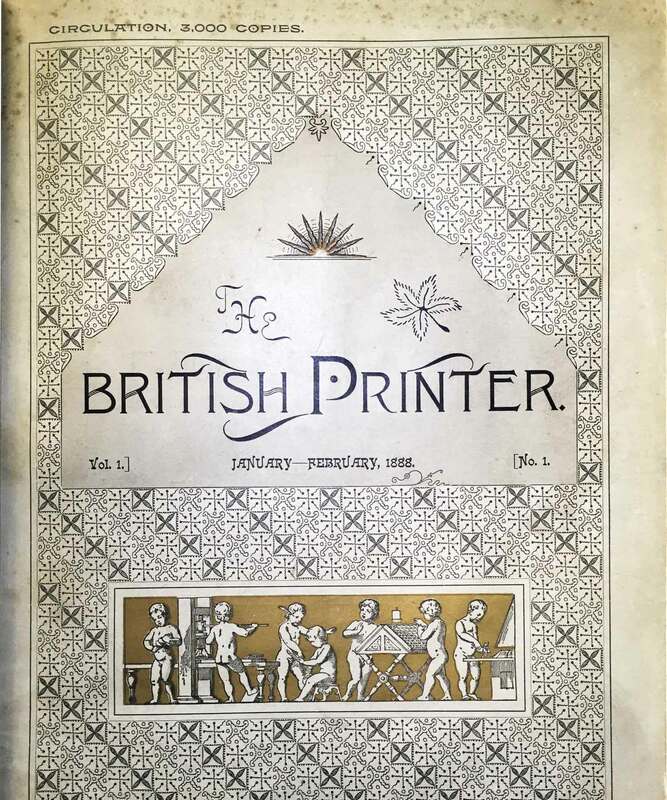 A printing school was a natural fit, and in 1895 the St. Bride Foundation filled the gap by training new waves of printers and typographers, while, incidentally, establishing a convivial place to hang out and get sociable. On the ephemeral side, it is worth noting that there was also a swimming pool here. Except that it doubled as a public bath. The water was clean as a whistle on Monday, but by Saturday it was a bit murky and suspect. The entire thing was drained every Sunday and refilled. Ergo, happy Monday. St. Bride’s Church steeple (considered to be the inspiration of wedding cakes, was designed by Christopher Wren in 1666. The adjacent library contains books dating to the 16th century, including a fine copy of Dr. Johnson’s Dictionary. The Passmore Edwards Room, with a bas relief of William Blades, the 19th century printer and historian whose own library became the kernel of St. Bride. 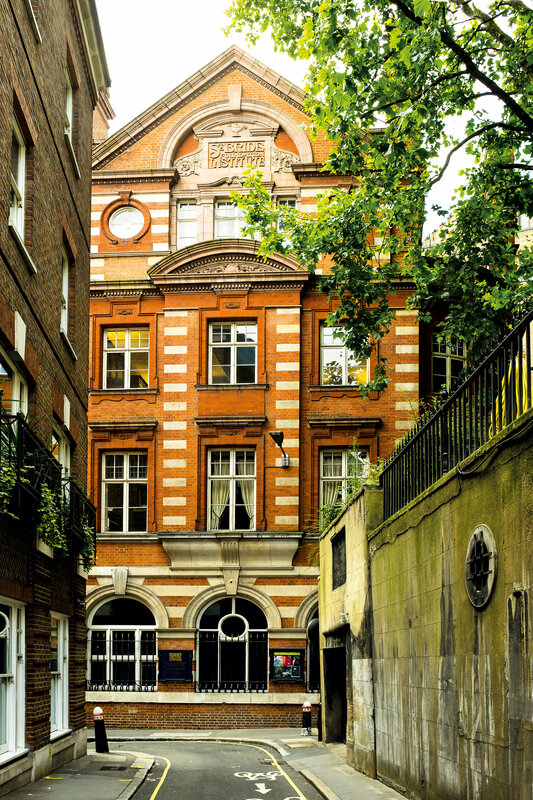 WHEN METAL TYPE finally bit the dust in the 20th century and newspapers moved to cheaper lodgings outside London, St. Bride became the de facto repository of English typographic history. It’s alarming to imagine the stress of which tons of metal packed onto myriad reinforced shelves might have on a 19th century building—the strength of beams and flooring necessary to support it all. Repository and library it might be called, but fortress is probably more like it. Most of the batteries of matrices are, unfortunately, difficult to access. They are fragile and prone to falling apart if moved. Some of them even have tags warning of potential weaknesses. But the books are another story. As well as the flat file drawers full of drawings, inked or just outlined, showing process, investigation, analytical rumination. The visualization of thinking. 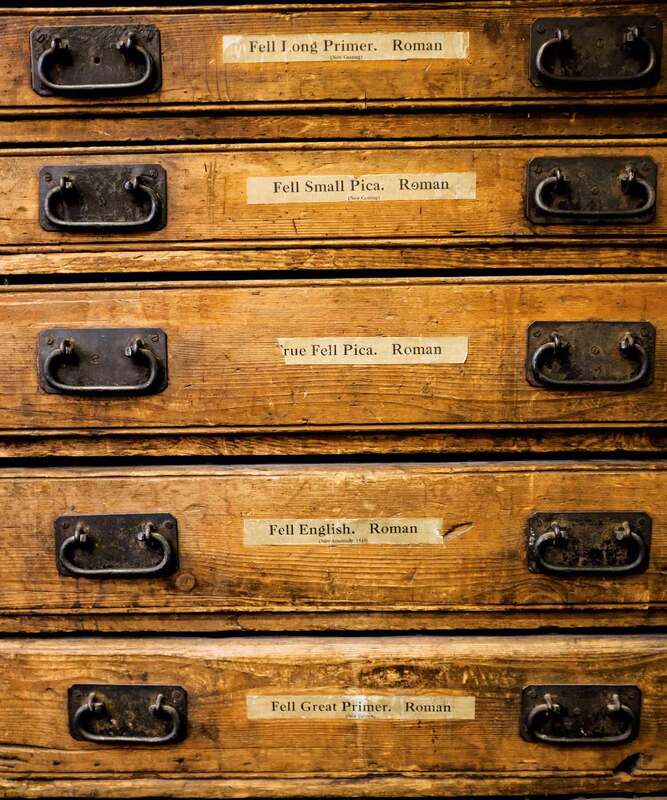 There are specimen books from every foundry in Britain, from first to last. Some are so slim as to show only a modest handful of fonts and sizes, while others are massive tomes devoted to every permutation possible, mutating from year to year with swathes, swirls, inlines and outlines. The amount of time, let alone money, needed to produce this cornucopia of options is staggering. You can only imagine the tension of competition which must have existed throughout the arc of metal foundries. 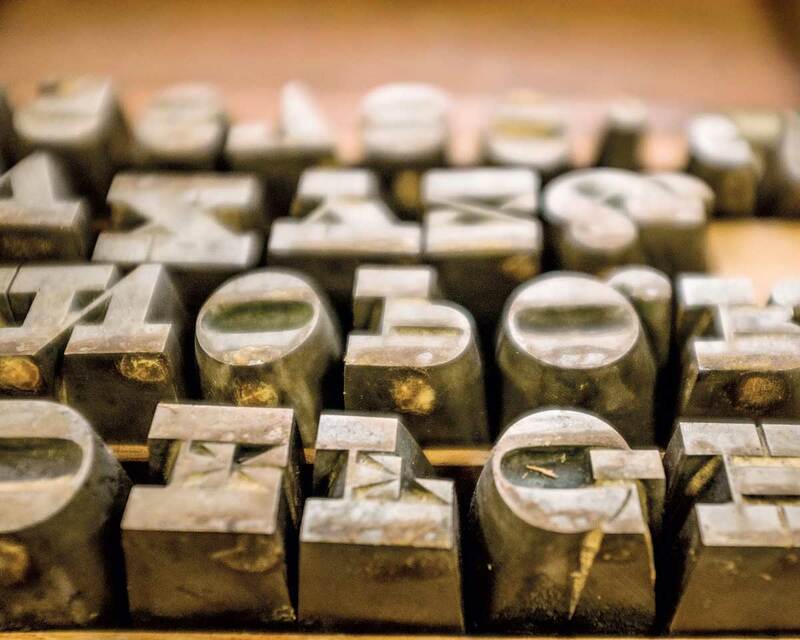 Nowadays, two of the volunteers at St. Bride, Mick Clayton, a journeyman compositor, and Bob Richardson, a designer who has run his own press for 47 years, are perfect examples of the formidable knowledge within these walls. Together they have a collective and unprecedented memory. They are a living catalogue of St. Bride. Computers are no match for them. And incidentally, they also give tours of the place, demonstrations, and are known to recount arcane stories at the drop of a hat. Paul wanders purposefully through the sliding shelves picking out gems. Without context, punches can look primitive, useless. But in context, they have an aura of excellence, technical mastery and innovation. Not to mention the result of constant evolution. For example, the difference between Dutch types of the early 18th century and Caslon’s first font in 1722 is fairly apples and oranges. Caslon’s letters are crisp, refined, even, elegant. How did that happen? And in such a short time? The word “genius” burbles up to mind. CASLON IS PROBABLY the main player at St. Bride, with detailed documentation in a panoply of permutations from smoke proofs (which, according to Bob, are best made using the smoke from tallow candles) to the smallest-sized punches, only slightly larger than a pinhead. Think about carving a four-point “w” crisply and cleanly into a tiny stalk of steel without the help of a microscope and with 18th century tools. Like trying to remove a splinter with a pair of pliers. Caslon’s first specimen sheet in 1734—28 styles in nine languages—took 14 years to complete. And the crazy thing is, while punches are fairly indestructible, letters could go missing or end up corroded and unusable if stored badly, so a punch cutter’s job was never done. On the positive side, it was lifetime employment for anyone with the talent. But it was also an opportunity for relatively large-scale general employment, which necessitated people to cast the fonts, finish them, package them up, as well as a multitude of strong backs to drag the raw metal from the basement up to the foundry. At its height, the Caslon foundry alone employed many dozens of bodies, men and women and boys. In its time, Caslon was king. Or at least the market leader. 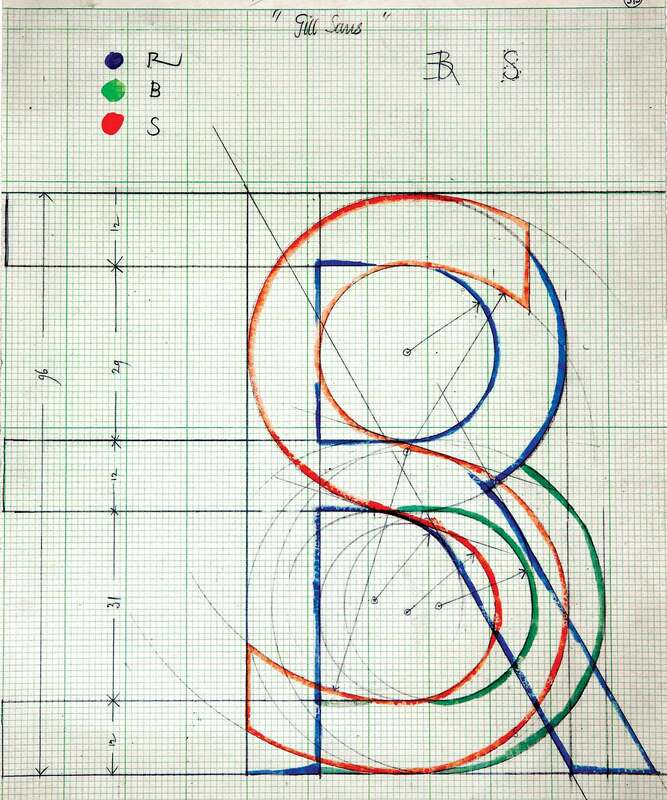 There is a broad range of type, materiél, drawings, and books at St. Bride. 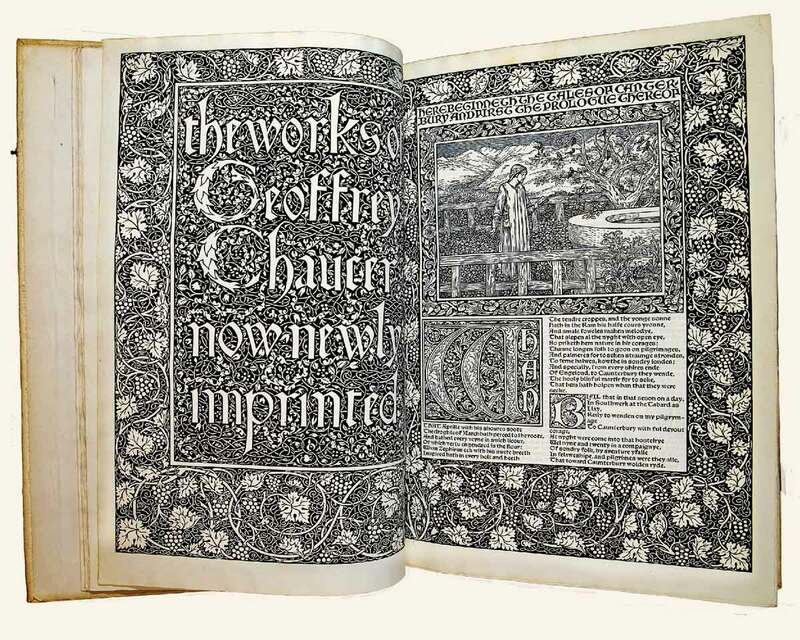 Above: Caslon’s punches for 5-Line Pica Italian (with the stress turned horizontally), 1839, and a Chaucer anthology from the Kelmscott Press, 1896. 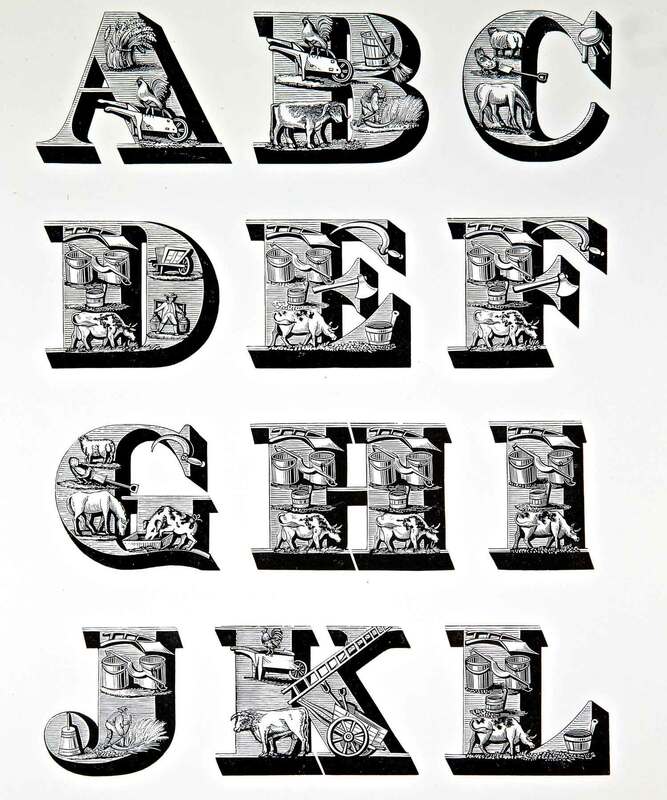 A case of the famous Fell Type, which James Mosely rescued from Oxford University Press when the letterpress printing operation was wound down; a proof of the Pouché decorated types; the cover of a trade publication, British Printer, 1888, and original drawings of Gill Sans by Eric Gill. PAUL LUGS A SMALL BOX out of the shelves, about half the size of a sheet of paper and maybe three inches thick. Sixty-point punches. The box must weigh 30 pounds. With the flick of an eye he can spy areas of wear & tear or inconsistencies, the year the punches were cut and the foundry. This is like archeology, and we’re looking at the bones of typography. On the other hand, modern typography has no more bones, no more physical trace except for what ends up on printed surfaces, and most of those have highly limited lifespans. St. Bride is a massive archaeological dig, the last of its kind. Oddly enough, type cutting and traditional printing techniques have lately gained a second life, which has, in turn, made the St. Bride collection doubly valuable and rare. And since they have what are probably the most and best examples of every English typeface, punch and matrix which weren’t melted down for scrap in the ’50s and ’60s, St. Bride is bound to outlive us all. A look inside the great St. Bride Library. Vincent Winter, design consultant for TYPE, is an American photographer and designer in Paris. He worked at Rolling Stone in the ’70s, and then in the ’90s established two design studios with Roger Black, WB Associées and Interactive Bureau France. While keeping a hand in design, Winter turned to photography, both as journalism and as art. Some of this work can be seen on his site.